Hey all! I got this dress during Tatyana's CRAZY sale this September. It took me a second to get it photographed and such, in part because it needed a major ironing job, but here it finally is!! (Another dress I showcased from this sale already is the jam print dress). For a minute I thought it was too late in the game to get this dress out there in blog world, in terms of seasons, but wowza was I wrong! I thought this was a quintessential summer dress, even a spring dress, but I never considered it a fall dress until this photoset! The way the colors of this dress play with the subtle fall background exceeded my expectations. This is a really special dress. It's truly unlike anything that I own and likely won't be worn a ton, only because it's ever so slightly fancier than most of my getups. I mean, I dress up everywhere I go for the most part, but as this is a white dress it reads as somewhat formal or "special occasion" to me. Maybe I'll change my mind come spring, but this seems like the kind of dress you only wear to a summer cocktail party, showers, and a fancy brunch. We'll see. But either or, I'm totally in love with this dress. I wanted it since it was being previewed before releasing it and I'm so thankful Tatyana put it on sale so that I can own it. Oh boy...let's talk about Paris for a moment. I've been quiet on the subject on social media, in part because I rarely engage in meme sharing and without living there or knowing anyone there, I've been at a loss for words somewhat. I've also been through my own personal losses and have had people that I'm close to lose people in ways that shocked the world on a similar level, so when an event like this happen my heart breaks but I also feel thankful to not be individually impacted by it, also adding to the "speechlessness" that I initially have. For what I want to say next, and because it's the "positivity" portion of this blog post, I need to backdrop a little more of where I'm coming from so it's understood the way I intend it to be. As each year passes, I identify more and more with being a humanist. That philosophy aligns with my staunch belief that we all do the best we can, with the circumstances we have, and we all have a story that's our own that shouldn't be pitted against others for comparisons. In short, I cringe when people talk about being "better" than others and when something devastating like the Paris attacks happens, my heart breaks for both the individuals who lost their lives, but those who are grieving the lives lost. It doesn't matter what these people did right and wrong in their lives, or what made them successes or failures, the fact that these lives were snuffed out too early and in such a senseless way proves that they are all equal and that it's an absolute tragedy that they were killed. It's a terrible equalizer, but an equalizer none the less as we as a society equally grieve each individual who lost their life. As for the terrorists, I'd be lying if I said my belief system doesn't get challenged in regards to believing that nobody is better than others. How can that be when people are out there murdering people? It's easy to say the terrorists are worse, and I couldn't stop anyone from arguing that point because there are countless effective means of proving it. What I do take comfort in is that I don't believe in hate. It's a self destructive energy at best and a destructive at large energy at worst-- spending time hating someone will get you nowhere, and hating in general can lead to verbally, emotionally, mentally...and of course, physically harming people. I'd say it's okay to hate the terrorists if you are working through strong emotions about this event, but give yourself a cutoff for that hate so it doesn't swallow you up. In my humble opinion, not hating people who do terrible things is a way of breaking the cycle...though that is only my opinion and I respect that other people have different paths and reactions to these types of things. My method for dealing with people who do the most unfair things in life is trying to muster up the strength to have compassion, not for what they've done, but for what crazy path led them to do what they did. Mental illness, lifestyles that inspire killing, unsupportive families, lower intelligences that can lead to a form of brainwashing, dire personal circumstances, a combination of any of the above, lead people to make terrible decisions. Yes, at some point they could have changed their course. It's a tragedy on more levels than I can count that they didn't. Human nature does err on the side of being good, so something went horrifically wrong in their stories. I don't excuse or forgive them, but I try to have compassion that a human life went wrong in the worst way possible, and I'm just thankful that I wasn't born into circumstances and an environment that would lead me on such a path. That's all I can know, because how people commit such crimes is a mystery. And why the random people who were killed got chosen is even a sadder mystery. My message isn't to tell you how to feel, or how to think. I'm just sharing how I try to rise above the unfairness in the world as one thing is for sure: nothing about this world is fair. Here's where the positive part comes in, and I think we all need to hear this. People still die, and unfairly, and there's nothing good about that as every life is supposed to mean something. Having a life cut short is awful on levels that words can't describe. BUT, the world is a safer place to live than it once was. It's easy to think otherwise because school shootings, while they always happened, have risen over the past two decades (especially lately, it feels), people can't feel safe in movie theaters anymore, there's always some country being attacked, and the threat of war is always lingering and especially when news breaks that North Korea may or may not be close to making their own nukes. These are all scary things not to be sniffed at. But statistically speaking, we're not actually going to hell in a hand basket. The 24 hour news stations and push notifications on our phone, all by outlets that at the end of the day need ratings to survive, not only do what they're supposed to do and inform us of what's happening in the world, but they put the most sensational things on repeat for ratings and viewers. Eventually it becomes a form of brainwashing, because we only hear the bad things on repeat and therefore think the world is falling apart. This article can explain it better than I can, so please read it if you're feeling awful about the state of the world. (There's others that talk about different ways the world is safer, but offhand I had trouble locating them). Again, feel whatever you feel about this 100% heinous event. There are no good feelings to be felt about what happened on Friday. That said, I thought sharing my personal ways of dealing with this AND some statistical good news to drown out the utter sadness that is playing out on repeat on your TVs and Facebook newsfeed was a good way to go. Additionally, as I have a lot of international readers and blogger friends, my heart goes out to you if you were personally impacted by this tragedy. I wouldn't wish that on my worst enemy, so I certainly wouldn't wish it on you. I know words like this can seem empty, but I hope that because the whole world is on your side brings some comfort in an otherwise dark period, as little as it may be. Given the heaviness of this post and the timing of it, I opted not to include a song name that would become this blog's title with a corresponding YouTube video. It felt like too big of a mood shift to make. Within the same lines, I have postponed not one but two outfit posts that have Paris themes on the prints of my clothing. I respect and support those who have worn their dresses with Eiffel Tower prints to showcase their support, but something about posting these already done and ready posts within the week after felt slightly off to me in a way I cannot describe. In a week or two I will reschedule those posts. This dress is absolutely beautiful! 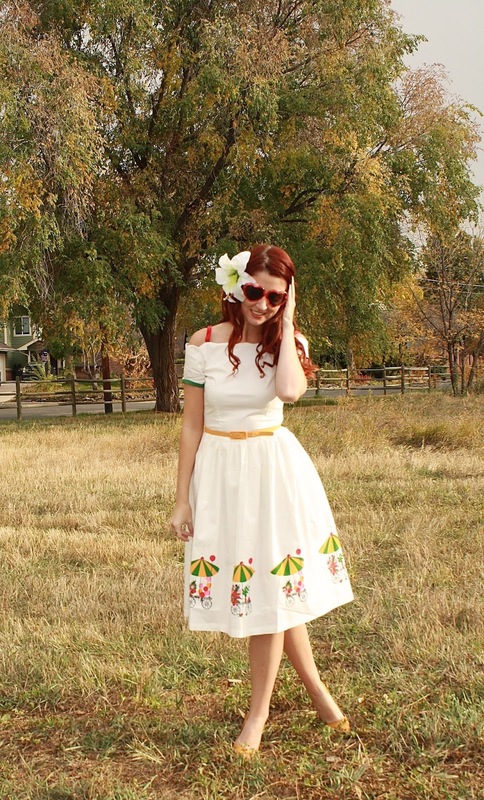 The print is darling and reminds me of warmer days gone past lol. The colors do have a fall theme to them as well, which I love since it makes this dress multi seasonal! Beautiful words about Paris. I love your flared midi dress and the accessories are perfect!!!! Such a pretty look, the color of the tote is amazing. When it's getting so cold here, I can't believe that it's so warm somewhere in the world ha! I have friends living in Paris, none of whom was affected in person. And while my heart goes out to the people feeling the fear and the loss I can only barely imagine, I feel the need to continue living, in all due respect, and not let myself be forcefully changed. I am at a loss for words, as well. Anything I post on social media, etc. just seems a bit a hollow, as I don't know anyone personally effected. That doesn't mean however, that I don't feel awful for those effected by this senseless act. But hate is not the answer. I very much agree with what you are saying in this post, and I will have to check out the article you shared. Right on. It's nice to have someone in the same boat. Aw, and thank you! Love the dress! The scallop neckline and green sleeve detailing make it so unique. Well, having a religious studies background I think that issue is a bit more complex. I agree that every religious text has good in it, but I believe every religious text also has bad in it too. No matter, it's super sad what happened. Happy to see you can still rock a summery dress for fall - the weather must be nice there! Thank you! It's nice back and forth. It'll snow one day and then be 60 lol. What a gorgeous outfit! The hair flower, shoes, and purse are all perfect with that dress. I had thought abotu trying it on when I was in Vegas, but decided against it, because for me, it's too much white. This dress is adorable! I love the off the shoulder neckline. And I can't get OVER that green bag! You touched on so much here that I couldn't put into words. I can usually write but not this time. It Is a safer world but with new problems. But it did cheer me up to see your gorgeous dress! What a pretty dress! These photos are beautiful! The scenery and lighting is on pint! 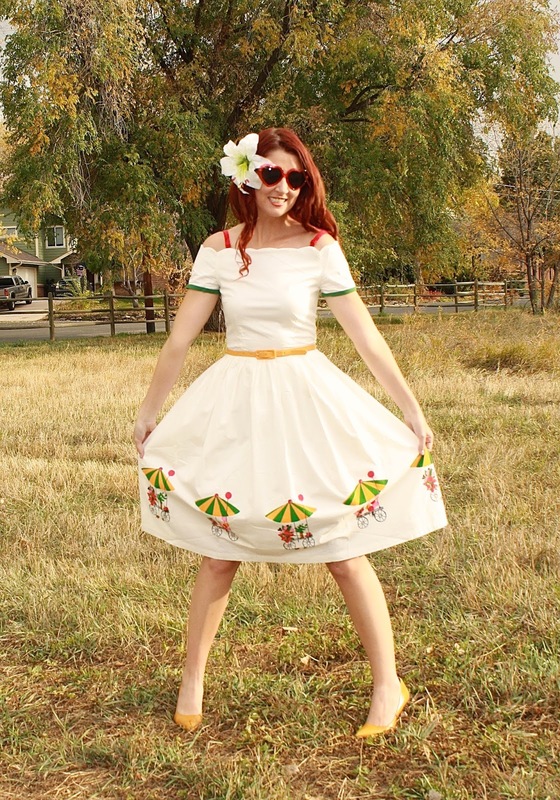 The dress is so quirky and fun! And Paris, please don't forget about Beirut and Syria, too. If it's wrong to kill innocent people in Paris, it's wrong to kill people ANYWHERE. What a perfect dress, and perfect location for photos! You look beautiful! Such a chic look dear ,you look stunning ! You always look so cute!! The print along the trim of the dress is way too adorable!! Such a lovely dress and that purse is so beautiful and different, I love the green color! I hope you have a wonderful day, beauty! Such a pretty dress. I like the playfulness of it all. Gorgeous dress, you really kill that red and green every time. I had no idea somebody could wear both of those colors and make it looks so damn chic! As for Paris, you know what I think it highlights western culture's selective grief. The same thing, if not worse, happened in eastern or "brown" countries and nobody even cared. There was no Beirut or Kenyan flags on FB, or CNN, or anywhere near as much press coverage. The selective grief is something that has got to change..
You look absolutely adorable, hun! Love your dress, looks great on you! Beautiful photos! First of all, I loved the dress, I loved the dresses you wear, they are so sweet and this one is proper to the station, I am sure! And you look so beautiful! As for the Paris attacks, I agree with you, How can we say that nobody is better or worse than anybody else when we see these people killing like that? I won't feel safe in theaters, true, but I don't know how to lead a normal life now, without fear. I was even thinking of moving to the countryside. I loved your post! This dress is a must for summer time! I mean how cute and elegant it is? Amazing! I just love how you style them! About the Paris, we pray for the whole world, as there are too many bad thing happening which media reflects selectively. I appreciate your thoughtful post about Paris. I think it's easy for people to jump on the "hate" train and forget that there are multiple sides to every story. There are plenty of takes on tragedy that don't get airtime and people need to be made aware of that. For instance, my partner is from Beirut, a place where something very similar happened the day before and yet no one is talking about his country. There are no representations in the media featuring the colors of the Lebanese flag in support for those people and the same goes for many other countries who have been through events like this. Gorgeous photos! It looks like it was a perfect Autumn day! I can't believe how quickly autumn seems to be going this year! I love your Tatyana dress! <3 Looks great on you! 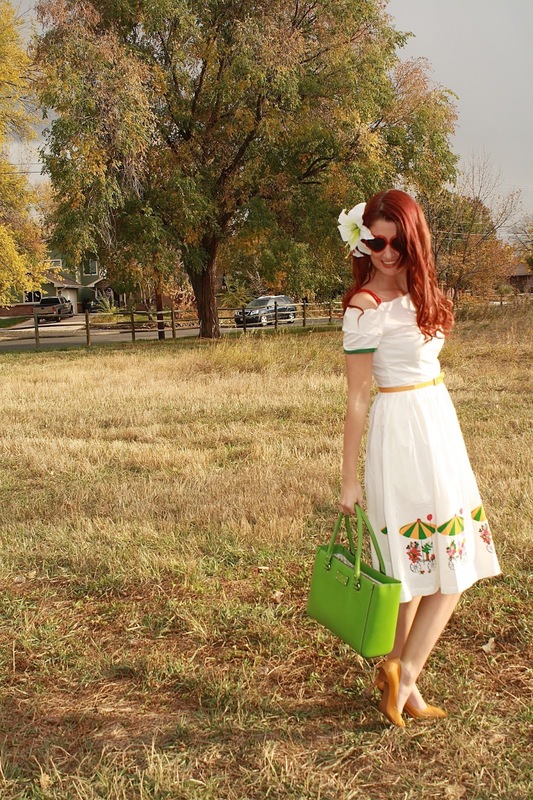 Very cute outfit, I especially love that green tote you added to this look! Music, Fashion, and Hall and Oates!